Hamas leader Yahya Sinwar says that "March of the Return" will continue until the return to "Palestine" is realized. "Our [Palestinian] people today stuck to the basic principles, the right of return and the breaking of the siege, and they support the resistance," said Sinwar, who came to encourage those who participated in the disturbances on the occasion of Land Day. He added, "Our [Palestinian] people say en masse that they want to live in dignity and want to live, and they say: ‘O (Al-Qassam Brigades), beloved ones, bomb Tel Aviv.’"
According to Sinwar, the issue of the terrorist prisoners in Israel is at the top of the list of priorities in Hamas' talks with Egypt and Qatar, which are serving as mediators in negotiations with Israel. The riots took place a day after reports emerged of an agreement between Hamas and Israel on a calm in Gaza. According to the reports, the new agreement aims to end the violent riots held each week along the Gaza-Israel border, as well as prevent rocket attacks against Israel. In exchange, Israel will allow the Qatari funds into Gaza and ease restrictions on both Gaza's fishing area and its border crossings with Israel. 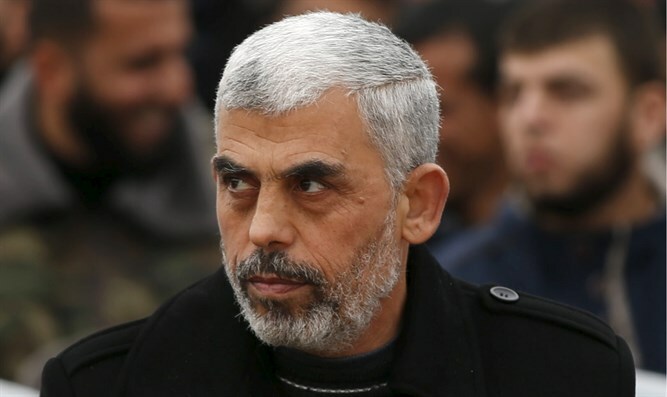 Meanwhile, Deputy Hamas leader Saleh al-Arouri stressed earlier that the agreement "is not a peace agreement" and is unconnected to diplomacy.